Eye makeup can be difficult to wash off, especially eye liner because it’s so close to the lashes. The delicate skin surrounding the orbitals dictates use of a milder cleanser. Generally, eye makeup removers can dry the skin and will sting if they get into the eye. Lancome’s Bi-Facil Dual-Action Eye Makeup Remover is a two-phase cleaner. The bottom phase is water soluble, while the top is oily. The two mix marvelously into a foamy liquid that is used like any other makeup remover – placed on a cottonball and swiped across the eyelids. The scent is pleasant, perhaps chamomile. The oil part prevents the skin from feeling dry after the procedure, moisturizing. Bi-Facil also calms the delicate eye area, so it should not be red or irritated after use of the makeup remover. Although the mix feels uncomfortable if it gets into the eye, it does not sting and a bit of blinking fixed the discomfort for me. The best makeup remover for me has been the general in-shower cleansing with L’Occitane Shea Butter Extra Gentle Soap. For very sensitive skin on the face or for individuals who do not consider soap to be the right way to go about removing makeup, this may not be an option. Lancome’s Bi-Facil will remove at least 90% of makeup while soothing and moisturizing. 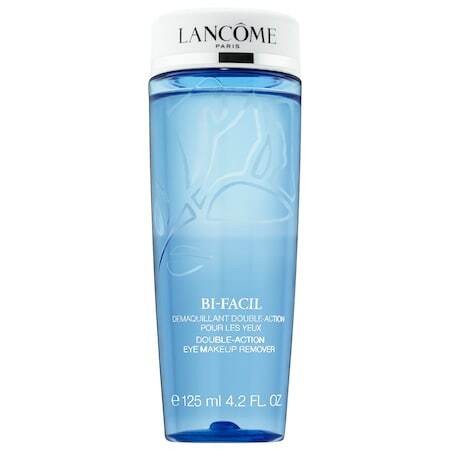 Lancome Bi-Facil Double-Action Eye Makeup Remover: 4.2oz (125ml) for C$35.00, 6.8oz (200ml) for C$42.00 @ Sephora.ca.